It is what is says, people! ;-) I ducked out some handling noise, but for the most part the audio is unaltered. Enjoy. Yes, the Noise Jockey Corporate Yacht follows the Noise Jockey Online Branding and Color Usage Guidelines. Kayaking on the Whiskeytown Reservoir in Northern California, I was surrounded by motorboats pulling wakeboarders. I wanted to see what all those speedboats sounded like underwater, so I dropped my hydrophone over the side and took a listen (with my field recorder safely under the deck of my kayak, in a dry bag). The inboard engines emitted a clean, high-tech whine with none of the chunky, air-gulping combustion engine sounds we typically hear in the air. “Spaceship,” I instantly thought. I merged two recordings of these motorboats, each about half a kilometer away, futzed with them just a tad (sorry, my effects chain is lost to the dim mists of time! ), and turned it into a loopable drone. 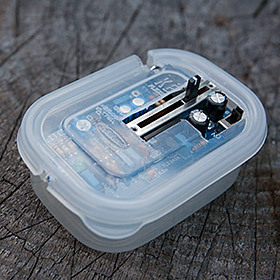 Beer, toiletries, ice chest, field recorders. Yep, that's a well-stocked camping trip! The metal bearproof food locker is a common sight in the developed campgrounds of the Sierra Nevada mountains. They’re infamously noisy to open, close, and move things around in, and are usually the first sounds you hear in the morning. They do their job, though…provided you have them closed. I once had a close encounter with a bear whose head was stuck right into my slightly open bear locker (in my defense, it was in the midst of dinner preparation), but that’s another story for another blog. I finally decided to record one on a trip this summer. It was a kayaking trip, so I had both my Zoom H2 [yeah, this is an older sound] and a hydrophone, so I decided to use both: The Zoom would get the stereo effects and the hydrophone would pick up the raw vibrations. 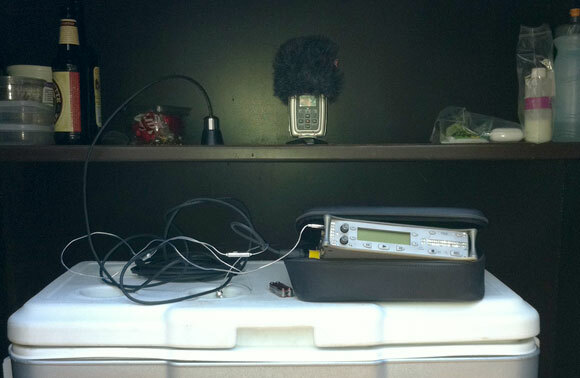 I placed the H2 horizontally centered in the locker, and placed the hydrophone on the single shelf inside. Holy resonance, Batman! 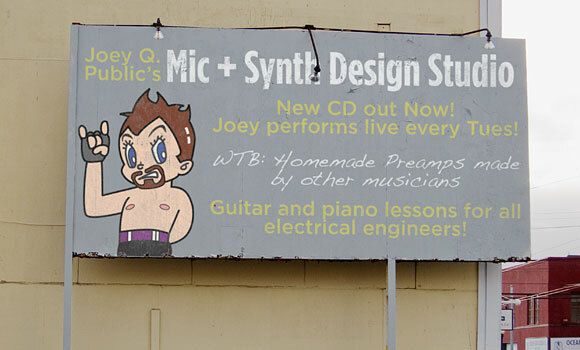 Use gear made by those who make gear they themselves use, and make gear for other users. That's prosumerism. The title of this article isn’t what you think it is. You can’t shop for electronics or technology without hearing “prosumer.” People assume this portmanteau is a contraction of “professional-consumer.” Only marketing wonks have made it so. That is neither its original meaning, nor the topic of this post. The term was coined in Alvin Toffler’s seminal book Future Shock as a contraction of “producer” and “consumer,” predicting the merging of the roles of consumption and production into the life of one individual, primarily due to customization of mass-produced objects and the creation of highly specialized products. That is, person A makes widget X, who sells X to person B who makes widget Y, which person A, in turn, buys…it’s a massively networked set of cottage industries. This trend has exploded in the last decade. When Wired writes about micro-manufacturing and “no more factories,” we’ve probably arrived at a prosumer tipping point. That, dear friends, is what this post is about. And yes, this is audio-related. Chances are, this article is probably about you, too. "Sump pump." I mean, ewww. What is "sump," anyway? Sure sounds like it's something in need of pumping! Our house is very poorly placed on its lot. Since our place is downslope from the street, water runs down the driveway towards the house. Thankfully, someone long ago put a pretty good drainage system with an electric pump that pumps the water back to the curb, where it can run to a drainage grate in the street. In the midst of a week of spring rain, I decided to toss the ol’ hydrophone into the drain box and record the pump, which is activated when a bobber reaches a certain height. The drain box is poured concrete, so it’s acoustically reflective. The pump kicking in is my favorite part, sure to be used for something later on. The big dropoff in volume is where the hydrophone was left high and dry when the water level dropped. 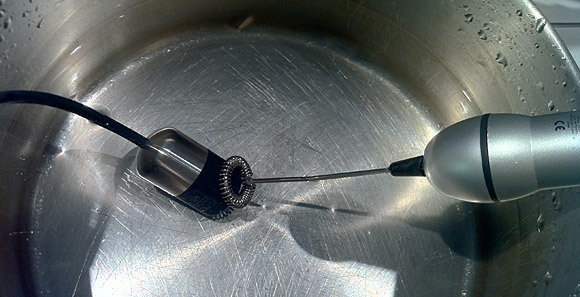 Notice how the sound of air bubbles become more pronounced as the water level meets the capsule, and then passes by it. Water turbulence right on the capsule tends to be very loud, as it imparts direct mechanical vibrations to the mic element itself. Dipping struck finger cymbals into water creates some great filtering effects. So a fellow gets a hydrophone. He’s excited, and starts recording all sorts of crap. But then he has a free hour to himself and realizes that he’s got a box full of sound-making toys and objects that could sound pretty interesting underwater. Let’s say I’m that fellow. Before work one day, I sifted through said toybox and decided to give this a whirl. In search for a large container to fill with water, I decided to record in the executive washroom of Noise Jockey World Headquarters, and the photos in this post will give you a glimpse of the sumptuous luxury in which we conduct our noisy business. Since our high-tech executive spa didn’t have a stopper handy, I grabbed a plastic tub and filled it with lukewarm water. 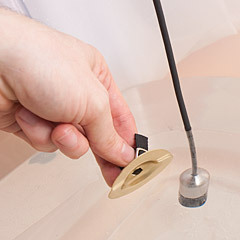 I put the hydrophone halfway between the surface of the water and the bottom of the tub, suspended from a boom arm so the cable would be isolated from noise and the mic element wouldn’t sit on the bottom. 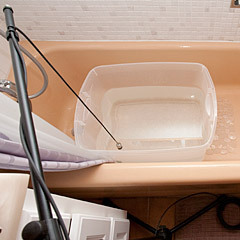 An Aquarian H2-XLR hydrophone set into a tub of water. The Aquarian H2a-XLR hydrophone is pretty heavy and holds quite still. One gotcha is that a high-frequency hiss can occur from air bubbles forming on the microphone casing. This can be a challenge if the water coming out of your spigot is highly aerated. I’m still working on solving that one. I donned a pair of finger cymbals (truly something every sound recordist should own!) and dipped one or both of them in the water after striking them together. They went into the water at a 60°-90° angle, so that they’d not create entry splashes or secondary water drips. This created a really neat tone that combined a pitch bend with a very resonant filter cutoff. I’ve attached an edit of the raw recordings to this post. Pitch-bent down or up, obviously, there’s a lot of sonic possibilities for sound design. As with all such experiments I do, I tracked at 192kHz to ensure enough latitude for further sonic malfeasance. 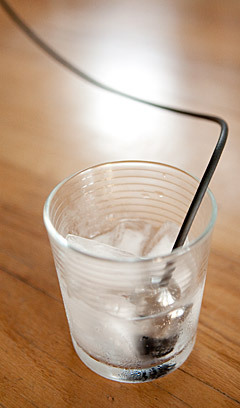 Hydrophone + Ice + Tonic. Sound and cocktail design in one easy step. I also got the rubber cup that enables it to be used as a contact microphone, and I must say that it also excels in this capacity: Super-low noise and very articulate, even recording human heartbeats with clarity (Hint: Aim for the sternum, the pecs have too much muscle and fat in the way). The H2a’s weight, however, prevents it from being easily taped upside-down or held in odd positions like my other contact mics I’ve used in previous posts. When the H2a came in, I placed this device in all the usual places you’d expect for some quick tests: the sink, the bathtub, the cats’ water fountain. But having just discovered some very tasty tonic water for making cocktails, it struck me that I’d not recorded carbonation before. After hearing the clear, but not overly-bright, tones of the carbonation, I decided to mix up the room-temperature tonic water with some ice cubes. The ice’s cracking, melting, and expansion was largely in the same frequency neighborhood as the carbonation bubbles and added an interesting dimension to the sound. Some initial sound processing makes me think that melting ice in still water might make for a cool creature sound pitched down -3 octaves or so, but for today, let’s listen to the original recording, unadorned and unprocessed.